Are diamonds a girl's best friend? If the girl is Paula Creamer, apparently so. 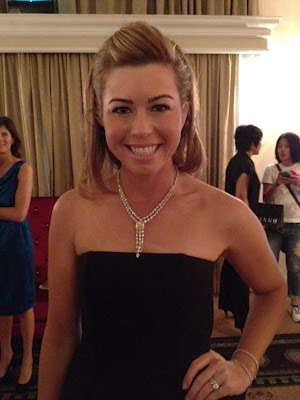 Creamer posted multiple tweets (@ThePCreamer) and multiple pics from the HSBC Champions party in Singapore, at which she (and other players) wore jewelry provided by Tiffany's. Creamer tweeted that she wore diamond jewelry worth $4 million. Natalie Gulbis isn't the only golfer appearing in the 2012 Sports Illustrated Swimsuit Issue. Blair O'Neal is in there, too. Just as it did last year, Cobra Golf - one of Blair's sponsors - bought an ad in the swimsuit edition and used a photo of O'Neal in a bikini to get our attention. Guess what? It works! As first reported on About.com, Natalie Gulbis is featured in the body paint section of the 2012 Sports Illustrated swimsuit edition. More of Natalie's bodypainting pics are now viewable on si.com/swimsuit. What a great early birthday present for Jessica Korda - her first LPGA Tour victory at the 2012 Women's Australian Open. Korda is 18 today, turning 19 only 15 days after this victory. That makes her one of the youngest winners ever on the LPGA Tour. Korda had a stellar amateur career, including multiple early showings at the U.S. Women's Open (at age 15, she tied for 19th). She was a member of the 2010 USA Curtis Cup team, a winner of "the Sally," one of the biggest amateur tournaments, and generally turned a lot of heads. That she is going to be successful as a pro always seemed assured; now, Korda has affirmed all those early reviews. The 5-foot-11 Korda finished 92nd on the LPGA money list in 2011, which was her rookie season. For winning the Women's Australian Open, Korda got three times that much. Christel Boeljon is the winner of the Ladies European Tour 2012 season opener. Boeljon came from three strokes behind entering the final round to win the Gold Coast RACV Australian Ladies Masters, cosanctioned by the ALPG. Boeljon's scores of 66, 65, 68, and 68 gave her a 21-under-par total of 267. It's the second career LET victory for Boeljon. Her previous win was at the Turkish Airlines Ladies Open in 2011. The Dutch golfer also played on the victorious European Solheim Cup team last year. Great article on the Golf Digest website in which LPGA golfer Kim Hall goes undercover to find out how male golfers treat women golfers on the course. Won't surprise anyone to learn that most guys she encountered didn't want to play with her at first, only becoming comfortable with her once she demonstrated she wasn't going to slow anyone down. Also won't surprise anyone to read about how, when Hall was all dolled up and looking glamourous, none of the guys cared how she played or even if she was slow. Read the article here; it really is good stuff.